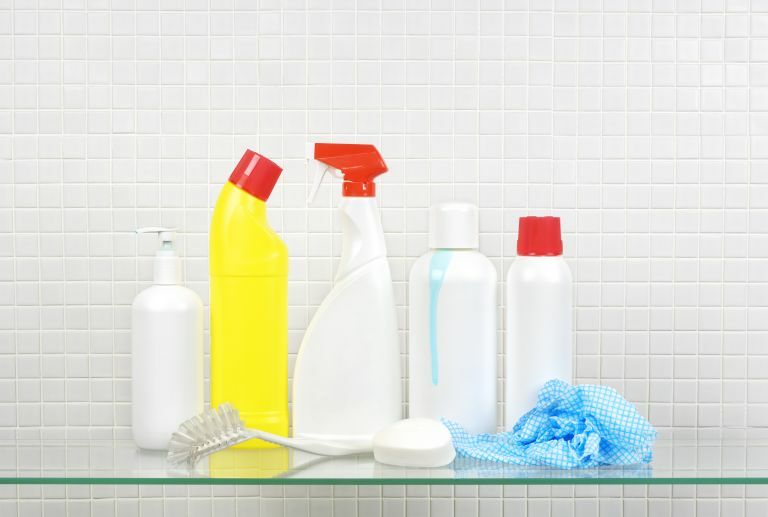 Cleaning your bathroom isn't the most exciting job, but with help from the best bathroom cleaners, it can be the easiest cleaning job in your home. Geared up to remove soap scum, limescale, and tough stains with no scrubbing required, our pick of the best bathroom cleaners will have your room looking (almost) brand new in no time. Looking for more cleaning hacks? Check out our 50 best home cleaning essentials for more recommendations. Or, find the best bathroom cleaning hacks for fast, effortless results. While bathroom cleaners often come in the form of spray bottles, one product on our list is a cleaning block that works once water is added. We've got something for everyone, whether you're eco-conscious, looking for a nice-smelling cleaner or something to leave your taps shining. As with the majority of cleaning products, before you apply a bathroom cleaner, you should open your windows to allow fresh air to circulate. This natty bathroom cleaning product can remove limescale, soap scum and tough stains, leaving your surfaces bright and clean. A great product for deep cleaning your bath in particular, it removes watermarks with ease. As for the rest of the bathroom, your taps and shower head will be sparkling in minutes. Simply spray the product onto your surface and leave for one or two minutes. Wipe clean with a damp cloth or sponge and you're done! It should be noted though, that it can't be used on marble, enamel baths, limestone and porous surfaces. For these surfaces use Astonish Cream Cleaner. Pretty amazing at removing soap scum, this Vamoose bathroom cleaner, however, doesn't smell like usual cleaning products (in other words, it's really quite pleasant). Great on taps, tiles, shower screens and baths, it removes stains without having to scrub. You simply spray the product onto your surface and wipe clean – it's as easy as that. For limescale or heavy soiling, leave to soak for two to three minutes before wiping. You can't use it on copper or brass fittings, but in our opinion, this is the best bathroom cleaner for those who want a sparkling bathroom but don't like the usual bleach-y smell. Made using plant-based ingredients, this eco-friendly bathroom cleaner is the best choice for those who are trying to be more green. The bottle is 100 per cent recyclable. Oh, and it also does a pretty good job at cutting through soap scum and limescale. Spray Ecover Bathroom Cleaner on to your surfaces and wipe dry with a cloth; for tough stains leave for a few minutes before rinsing with water. It's worth noting that it can't be used on marble and natural stones, and if you're thinking of using on painted surfaces, it's a good idea to test it on a hidden area first. Not just ideal for cleaning bathrooms, this solid cleaner removes dirt, limescale, oil, calcium build-up and grease while leaving a fresh lemon scent behind. Non-abrasive and organic, it features only biological and biodegradable ingredients to dissolve grease and grime from your household surfaces. Use on your taps and shower head for a guaranteed shine. It comes with a sponge, which needs to be moist before use. Wipe the sponge on the Bio-Mex, squeeze to produce a foam and you're off. Rinse with a damp cloth and wipe with a dry cloth to see the effect. You can also use it on your pots and pans for a real transformation. And because it's extremely concentrated, it'll last for ages. Fume-free with a pleasant hint of sweet basil, this bathroom cleaner isn't just eco-friendly, but it's also gentle on your surfaces and the planet. It can shift soap scum and limescale effectively, and the bottle is biodegradable. To use, just shake, spray and wipe clean with a damp cloth – easy peasy. It's best not to use it on marble or granite though, as it may cause damage.